One 500 gallon propane tank serves the entire property, i.e. both House and service buildings. A flow meter could be installed on the propane line leg that branches to the House ( estimated cost ~ $200), thus allowing propane use to be separately deduced for the two locations. However, at present (Nov 2010), propane consumption at each separate location (House & service area) can only be estimated. indicates House propane consumption (no AC) was 65% of total Love’s Point propane consumption. 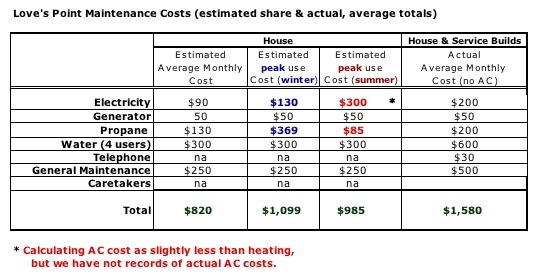 NOTE: If the House air conditioning unit were connected and operational during hot weather, propane consumption could escalate dramatically.